According to Dalí, "The noise of the bee here in Dream Caused by the flight of a Bee around a Pomegranate causes the sting of the dart that will wake Gala." The action of the painting — the larger pomegranate from which comes a fish releasing two tigers behind a bayonet — represents the woman's abrupt awakening from her otherwise peaceful dream. 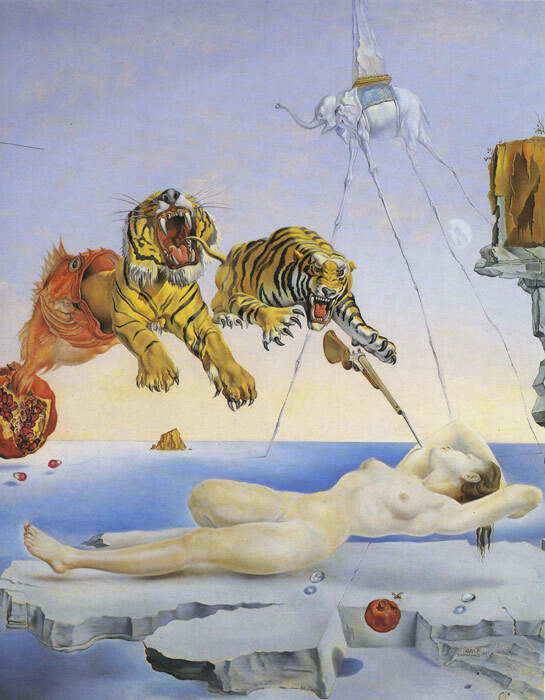 This is an example of Sigmund Freud's influence on surrealist art and Dali's attempts to explore the world of dreams. The musical band dredg attempted to reproduce an audio interpretation of the painting Dream Caused by the flight of a Bee around a Pomegranate in their album El Cielo. The booklet of which indicates "This album was inspired by a painting titled: Dream Caused By The Flight Of A Bee Around A Pomegranate One Second Before Awakening. It is recommend that you view this painting as you listen to 'El Cielo'. It is as if one stimulus awakens other senses. In other words, it's about drawing music." SPECIAL NOTE : The painter will make the reproduction as close to the original oil painting as possible. If you want your painting to alter from this likeness, please email us and " Dream Caused by the flight of a Bee around a Pomegranate " will be reproduced according to your special requirements.